On 29 May, Chairman of the board of directors of China Power Yu Bin met Wu Yin, counselor of the General Office of the State Council and vice chairman of China Energy Research Society, and Li Xiangbo, deputy secretary general of China General Chamber of Commerce. 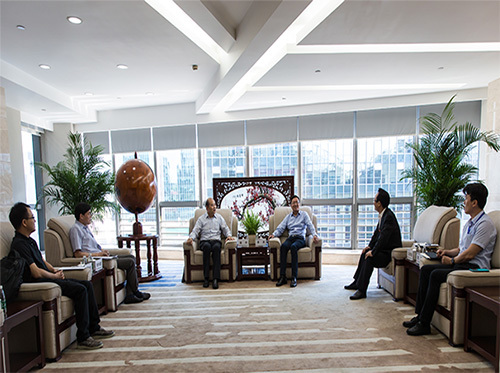 Yu Bin welcomed the visit of Wu Yin and Li Xiangbo, and hoped that the three parties can adopt a pragmatic approach to explore the integrated energy service model for business clients, based on the research foundation of commercial electricity consumption, and cooperate to build an energy system for the new era which places emphasis on cleanness, low carbon, safety and efficiency. Wu Yin and Li Xiangbo gave a brief introduction of China Energy Research Society and China General Chamber of Commerce respectively in a hope to urge the three parties to enhance exchange and visit and join forces to strengthen the cooperation ties in the field of energy consumption service so as to achieve multi-win situation. Lin Weibin, executive officer of the Energy Policy Research Centre of China Energy Research Society and persons in charge of the Policy Research Office and Electricity Sales and Integrated Energy Department of China Power also participated in the meeting.